Did you know that the average cost of a wedding was almost $26,000 in 2017? This bill can haunt newlyweds for many years, especially young couples who may already have student loan debt. If you want to have your dream wedding cake and eat it too, here are 5 tips for planning weddings over the holidays that won’t break the bank. One of the nicest holiday wedding ideas is setting the tone for your event with a special invitation. The invitation is a great place to start when thinking about your overall theme. Do you want to go for a winter wonderland style? Crisp white cards with gold, silver, or red accents are classy and memorable. Make your invitations pop by gluing a sprig of a cedar or fir tree from your own backyard. Whenever the weather is chilly, everyone wants to bundle up with warm drinks and comforting food. Some great Christmas wedding ideas include dishes that are normally featured at the dinner table. Your protein could be turkey or ham, and you can choose from a medley of delicious sides like mashed potatoes, steamed vegetables, warm bread, and more. Ciders and holiday cocktails are a must-have at winter weddings. Many recipes are so simple that you can prepare them ahead of time yourself. Another nice touch to your wedding could be a drink station where guests can grab a warm holiday beverage and a gingersnap or sugar cookie. Your color scheme is important for setting the vibe of a holiday wedding. Rich earth tones and classic holiday colors like red, silver, and gold can create a stunning atmosphere. 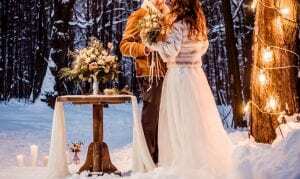 If you don’t want to worry about the decorations, hiring a Christmas wedding planner can be worth the cost. If you discuss your financial limitations beforehand, they’ll be happy to work within your budget. Bringing pieces of the outdoors inside can transform your venue. A simple DIY centerpiece project could be gathering pine cones and fir sprigs from outside and spray painting them with silver accents. Wreaths to hang around the venue are also easy to make yourself. As for flowers, buying in-season will save you money and add to the holiday cheer. Poinsettias, Christmas roses, and Camellias are a few popular winter flowers. The holidays are all about cheer, so paying attention to the lighting at your venue is key. Colorful Christmas lights may be over the top for your wedding, but white Christmas lights look elegant anywhere. Winding them around pillars and weaving them through the ceiling can add warmth to the room. Chandeliers with candles are another lovely addition to winter weddings because of their soft, romantic glow. Want to Plan Your Dream Wedding Without Breaking the Bank? Weddings over the holidays are spectacular, but it’s easy to go over your budget on decorations alone. Couples should be able to have the wedding of their dreams and still have money left for their future. That’s why The Bargain Minister accommodates every couples’ wishes for a fair price. To learn more about my wedding services, check out my prices.